CTC is converting to HDRF to provide our customers with HD quality service and to keep CTC’s TV equipment current and up to date. This new equipment will provide greater reliability and less signal down time. It allowed us to redesign the guide channel on 23 and make it more functional. 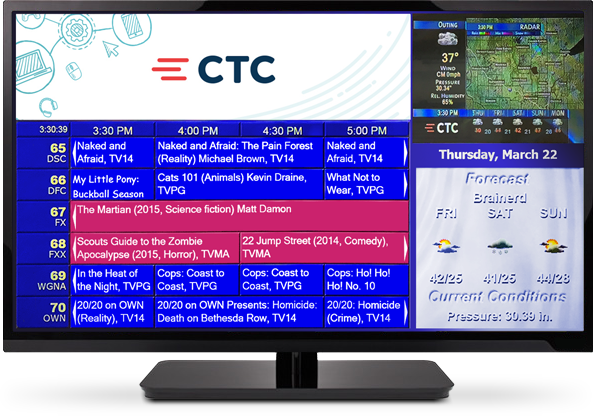 CTC still offering High-definition RF is beneficial because this requires no digital cable box, so it is a great option for easy-to-use TV service. If you have an old style TV then you have a couple of options. You can purchase a new HD TV with a built in digital tuner. It’s a great time to buy a new TV if you have been thinking about it. Purchasing a new HD TV with a built in digital tuner will allow you to take full advantage of the HDRF system from CTC. It will give you high-definition picture quality that will look great on your new TV. If you have any questions on the HDRF conversion process, please contact CTC at (218) 454-1234 and we would be happy to offer assistance.